When was the last time you were asked by a handsome boy you had a crush on to go out to a movie or a walk in the park, girls? Do your remember what outfit you wore? Was it an elegant dress or something more casual? Barbie is going on a first date this afternoon and she has a big dress up dilemma. She has so many fab clothes in her closet that she has no clue what to wear. First impression always matters especially on a first date. 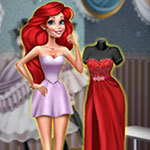 Help Barbie make the best dress up choice putting together the perfect outfit for her. The venue is a complete secret and it will only be disclosed to the cute doll when she arrives there. This makes the dress up part even more difficult, but not impossible. Risk it all on a glam and attractive dress and high heels, like for example a strapless red top and mini skirt combination. How about that pink princess gown with deep V like cleavage? Is it too much for Barbie’s first date or do you consider it a stunning dress up idea? Try a smart casual approach, matching a blue sequin bustier top with denim skinny jeans, high heel shoes, stylish scarf and blazer, fancy bag and gold studs. She will look fashion fabulous in a girly short skirt combined with a tank t-shirt, leggings and sandals. Go for a funky street hipster look dressing her up in that navy striped top and stockings, adding sparkly purple shorts and a sassy hat or hair band. Have a great time playing our newest dress up game, ladies!